The major body-fluid compartments includ: intracellular fluid and extracellular fluid (plasma, interstitial fluid, and transcellular fluid). The intracellular fluid of the cytosol or intracellular fluid (or cytoplasmic matrix) is the liquid found inside cells. The cytosol is a complex mixture of substances that include proteins, ions, and organelles dissolved in water. Extracellular fluid (ECF) or extracellular fluid volume (ECFV) usually denotes all body fluid outside of cells, and consists of plasma, interstitial, and transcellular fluid. An extracellular matrix is an extracellular fluid space containing cell-excreted molecules, and they vary in their type and function. Plasma also serves as an extracellular matrices (ECM) for the cells and molecules of the blood. Interstitial fluid (or tissue fluid) is a solution that bathes and surrounds the cells of multicellular animals. Transcellular fluid is the portion of total body water contained within epithelial -lined spaces. intracellular fluid: The liquid found inside cells, between the endomembrane and the membrane-bound organelles. interstitial fluid: A solution that bathes and surrounds the cells of multicellular animals; also called tissue fluid. The fluids of the various tissues of the human body are divided into fluid compartments. Fluid compartments are generally used to compare the position and characteristics of fluid in relation to the fluid within other compartments. While fluid compartments may share some characteristics with the divisions defined by the anatomical compartments of the body, these terms are not one in the same. Fluid compartments are defined by their position relative to the cellular membrane of the cells that make up the body’s tissues. The intracellular fluid of the cytosol or intracellular fluid (or cytoplasm ) is the fluid found inside cells. It is separated into compartments by membranes that encircle the various organelles of the cell. For example, the mitochondrial matrix separates the mitochondrion into compartments. The contents of a eukaryotic cell within the cell membrane, excluding the cell nucleus and other membrane-bound organelles (e.g., mitochondria, plastides, lumen of endoplasmic reticulum, etc. ), is referred to as the cytoplasm. The cytosol: The cytosol (11) is the fluid within the plasma membrane of a cell and contains the organelles. The cytosol includes dissolved molecules and water. The cytosol is a complex mixture of substances dissolved in water. Although water forms the large majority of the cytosol, it mainly functions as a fluid medium for intracellular signaling (signal transduction ) within the cell, and plays a role in determining cell size and shape. The concentrations of ions, such as sodium and potassium, are generally lower in the cytosol compared to the extracellular fluid; these differences in ion levels are important in processes such as osmoregulation and signal transduction. The cytosol also contains large amounts of macromolecules that can alter how molecules behave, through macromolecular crowding. Extracellular fluid (ECF) or extracellular fluid volume (ECFV) usually denotes all the body fluid that is outside of the cells. The extracellular fluid can be divided into two major subcompartments: interstitial fluid and blood plasma. The extracellular fluid also includes the transcellular fluid; this makes up only about 2.5% of the ECF. In humans, the normal glucose concentration of extracellular fluid that is regulated by homeostasis is approximately 5 mm. The pH of extracellular fluid is tightly regulated by buffers and maintained around 7.4. The volume of ECF is typically 15L (of which 12L is interstitial fluid and 3L is plasma). The ECF contains extracellular matrices (ECMs) that act as fluids of suspension for cells and molecules inside the ECF. 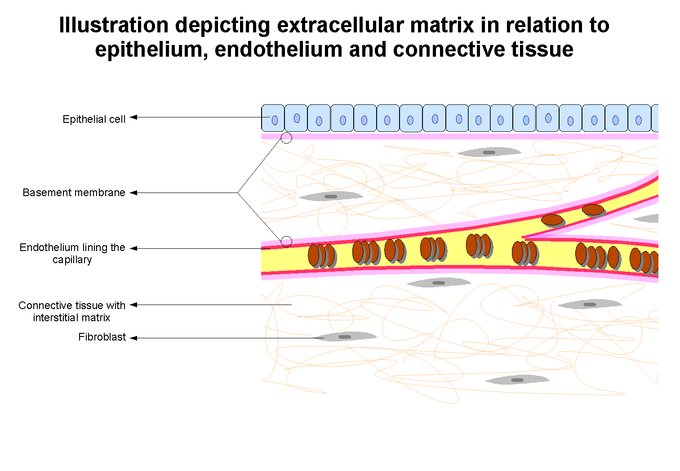 Extracellular matrix: Spatial relationship between the blood vessels, basement membranes, and interstitial space between structures. Blood plasma is the straw-colored/pale-yellow, liquid component of blood that normally holds the blood cells in whole blood in suspension, making it a type of ECM for blood cells and a diverse group of molecules. It makes up about 55% of total blood volume. It is the intravascular fluid part of the extracellular fluid. It is mostly water (93% by volume) and contains dissolved proteins (the major proteins are fibrinogens, globulins, and albumins), glucose, clotting factors, mineral ions (Na+, Ca++, Mg++, HCO3- Cl-, etc. ), hormones, and carbon dioxide (plasma is the main medium for excretory product transportation). It plays a vital role in intravascular osmotic effects that keep electrolyte levels balanced and protects the body from infection and other blood disorders. Interstitial fluid (or tissue fluid) is a solution that bathes and surrounds the cells of multicellular animals. The interstitial fluid is found in the interstitial spaces, also known as the tissue spaces. On average, a person has about 11 liters (2.4 imperial gallons or about 2.9 U.S. gal) of interstitial fluid that provide the cells of the body with nutrients and a means of waste removal. The majority of the interstitial space functions as an ECM, a fluid space consisting of cell-excreted molecules that lies between the basement membranes of the interstitial spaces. The interstitial ECM contains a great deal of connective tissue and proteins (such as collagen) that are involved in blood clotting and wound healing. Transcellular fluid is the portion of total body water contained within the epithelial-lined spaces. It is the smallest component of extracellular fluid, which also includes interstitial fluid and plasma. It is often not calculated as a fraction of the extracellular fluid, but it is about 2.5% of the total body water. Examples of this fluid are cerebrospinal fluid, ocular fluid, joint fluid, and the pleaural cavity that contains fluid that is only found in their respective epithelium-lined spaces. The function of transcellular fluid is mainly lubrication of these cavities, and sometimes electrolyte transport.